AIS Media franchise for sale. Free AIS Media internet consulting services franchise information. And that figure is only going to grow. As the number of businesses seeking to profit from the Internet continues to skyrocket, so too does the need for professional Internet services firms. If you are looking for a straight-forward way to capitalize on the high demand for professional Internet services among businesses in your area, partnering with AIS Media may be the ideal opportunity you've been looking for. AIS Media is an Internet development, consulting and services firm that combines the latest Internet technologies with proven business practices and expert marketing to help companies enhance their online image, create new revenue streams, streamline business processes and boost customer satisfaction. We are looking to expand our nationwide network of eBusiness Solutions Providers to offer businesses both the best technology solutions and personal one-on-one service on a local, regional and national level. By 2007, online retail sales will exceed $105 billion -- up from $57 billion today. In the United States, there are 5.9 million small and mid-sized businesses. It is cost prohibitive for most large Internet solutions companies to sell directly to small and mid-sized businesses. The opportunity is wide open for local providers to sell into this market. Sooner or later, virtually every business in the world will be using the Internet as a vital tool to reach more clients, just like a telephone and fax machine. The market potential and profit opportunities for companies that can deliver businesses the Internet services they need is virtually unlimited. The only question is... how will you be able to profit from this growth? AIS Media is one of the nation's leading privately held commercial Internet services and consulting companies. Our global client base ranges from small businesses to Fortune 500 corporations including SunTrust Bank, Pfizer, JC Penney, and others. Most companies offering similar opportunities are just selling a business opportunity, but have no actual experience in web design & development. When you partner with AIS Media, you align yourself with a market leader and gain the strong competitive advantage you need to enhance your company's credibility, acquire more clients and maximize your profit potential. Maintain complete ownership of all your clients -- for life! 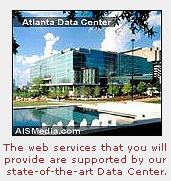 AIS Media's corporate office is strategically located in Atlanta, Georgia. Founded in 1997, AIS Media is the developer of the Excerpo® Storefront e-commerce platform and offers a full range of Internet services including managed hosting, secure payment processing, website development and Internet marketing solutions. We maintain our own production facility, staffed by a U.S. based work force, and manage our own web-hosting network in our state-of-the-art Atlanta data center. To learn more about the AIS Media franchise opportunity, simply complete the form below.